Welcome to Tailwind! Here's how to get started, step by step. 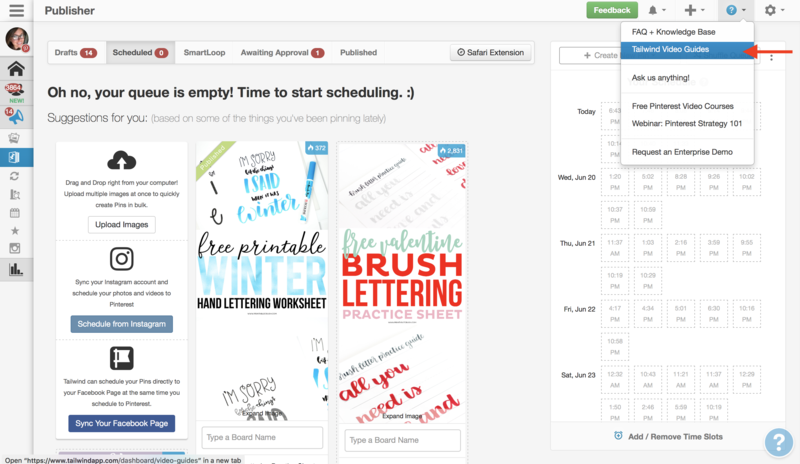 Thank you SO much for downloading our Tailwind iOS Scheduling and Publishing Mobile app for Pinterest and Instagram! We're so happy you found us and are ready to get started with making your marketing strategy easier and save time with Scheduling. First things first though, you'll want to create a Tailwind account to get started. Unfortunately, as you've just found we can't yet offer a way for you to create an account in this mobile app. So, we'll ask you switch over to the desktop version of Tailwind to create an account, and then you can switch back. Don't worry, its pretty darn easy! 2. Click on "Sign up with Pinterest" or "Sign up with Instagram"
Helpful Tip: Be sure to be logged into the account you want to work with in Tailwind on your computer. You can also change the account by clicking "Not the right account? Login"
3. Enter your email address that we can reach you with and a password to login with. This will now be your login to access your Tailwind account, and boom- done! Tailwind account done! 4. Go ahead and get started exploring Tailwind, install the Scheduling Extension for your browser, maybe start scheduling some Pins or Posts, watch some great Helpful Video Guides and check out the Knowledge Base (FAQ). 5. Your Tailwind account is set up and ready to go, use the same email and password that you entered a little bit ago to login to the iOS Mobile App and you can schedule on the go!